The following post is the response of James K. Galbraith, Ha-Joon Chang, and +29 Economist to the previous entry Ecuador's Macroeconomic Alternative Facts: Debunking the Distorted Analysis of 50+ Economists published on March 30. We publish here the entire document sent via email by William K. Black. We note that your response does not challenge any of the facts stated in our letter, nor does it show anything in our letter to be overstated, misleading, or exaggerated. In fact, it challenges only a few sentences, mostly by misrepresenting what we actually wrote. …innovative and important reforms that the Ecuadorian government has enacted that have played an instrumental role and allowed the country to emerge, relatively unscathed, from the 2009 Global Recession and the more recent collapse in oil prices. These reforms included bringing the central bank into the government’s economic team, a tax on capital exiting the country, a large increase in public investment, re-regulation of the financial sector, and counter-cyclical fiscal policy. This takes care of your objections to what we actually wrote. Now, you also raise some issues in which you present your own interpretation of the data of the past 10 years. This is another story, and something that we examine below. But please note that none of what you wrote supports your completely unsubstantiated and rather reckless claim to “refute the imprecise and false macroeconomic statements (or the so-called ‘alternative facts’) presented” in our letter. You noted that the growth of GDP per capita from 2000 to 2006 was faster than the growth over the last decade. However, it is not impressive that you can find a six-year period (2000–2006), in which annual per capita GDP growth was faster than during the last decade. The years 2000–2006 began with a recovery from a very deep recession (see below). By comparison, Correa’s term began with an economy that was near the peak of the prior 2000–2006 expansion; and the Correa decade also had two major oil price collapses, one of which, as noted above, came with the world financial crisis and recession. Given these conditions, and comparing as we did to the entire 26 years prior to the Correa government, it is fair to say that the growth record of the past decade is a substantial improvement over the past. 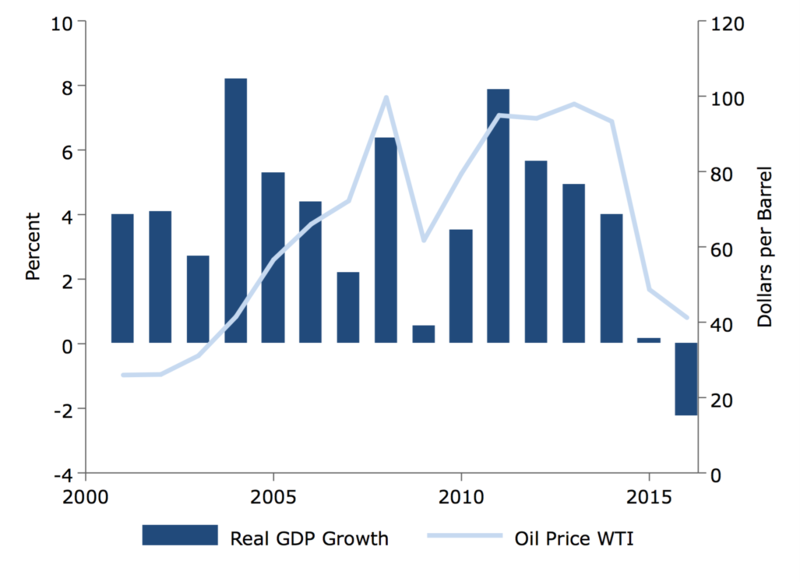 This is a strong statement that Ecuador’s economic growth during the Correa decade is simply a result of an increase in oil prices. There is little doubt that an increase in oil prices will generally contribute to increased GDP growth for an oil-exporting country. However, there are a number of ways in which an increase in oil prices can impact economic growth, and most of them can be greatly affected by government policy. If the government were to increase royalties or taxes on foreign-owned production that enable it to capture more of the windfall gains domestically, and if the government were to spend increased tax revenue from both foreign- and domestically owned production that would otherwise not have contributed to domestic aggregate demand, this would contribute to economic growth. In fact, the government’s oil revenues adjusted for changes in the price of oil tripled from $1.85 billion in 2007 to $5.4 billion in 2016. If the government during this period makes it more difficult for capital to leave the country by taxing capital flight, this would also increase the impact of the oil windfall on economic growth. And of course expansionary fiscal and monetary policies can also contribute to growth. The Ecuadorian government enacted all of these policies and more (see below) under Correa; but you appear to assume that these policy changes had no positive impact on economic growth. There were other counter-cyclical policies that also contributed substantially to economic growth during the Correa years: for example, the import tariffs implemented beginning in March 2015 under the WTO’s rules for a temporary balance of payments safeguard added approximately 7.6 percent of GDP over two years. Furthermore, you make this extreme assertion that the rise in oil prices is, by itself, the explanation of Ecuador’s economic growth over the last decade, on the basis of nothing more than a correlation between oil prices and GDP growth. This is clearly insufficient to support your claim. We reproduce your Graph 1 in our Figure 1A below. Figure 1A illustrates a correlation between oil prices and GDP growth. However, although oil prices produce a windfall in the oil sector, there is no guarantee that this would result in increased oil production, and without increasing real oil production, oil that sells at a higher price does not by itself raise real GDP. Ecuador is a member of OPEC — a cartel that aims to control oil prices through production agreements. Thus, we may expect some of the windfall to be a consequence of forgoing significant increases in production. Furthermore, windfall profits in oil may be captured by foreign investors, or spent on increased imports rather than stimulating demand for production in domestic non-oil sectors. 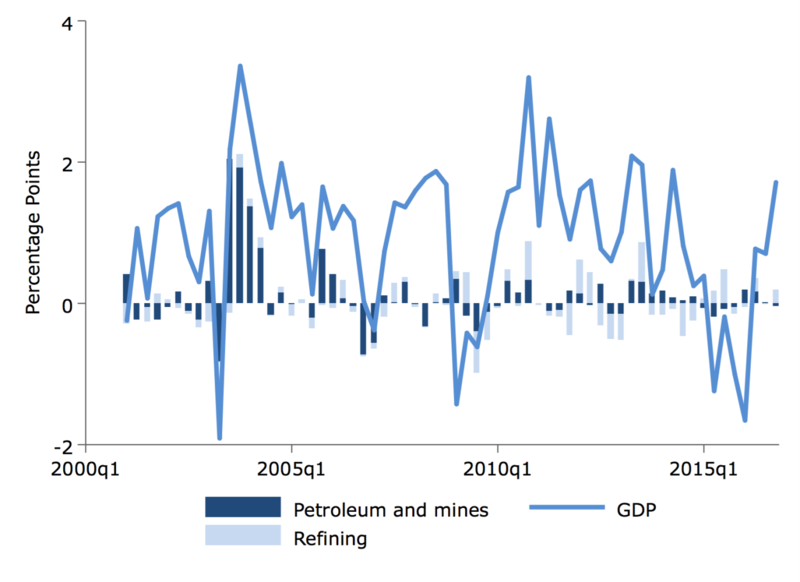 The observed correlation between real GDP growth and oil prices is not enough to tell us what happened. 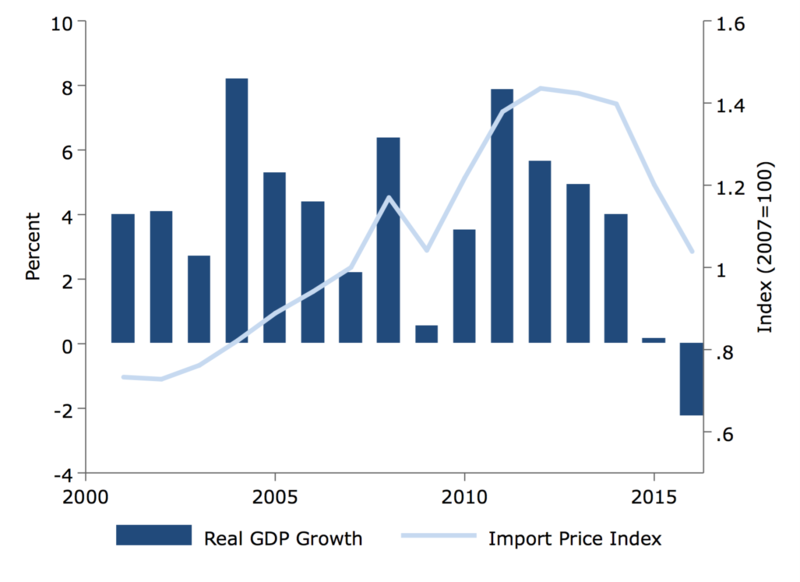 We can see this from Figure 1B below, which shows a similar correlation between import prices and GDP growth. If we look at the direct contribution of the petroleum sector to real GDP growth, it has not been large during the Correa administration. Rather, there were significant increases in this contribution to growth in the years prior — particularly in late 2003 and early 2004. This can be seen in Figure 2. 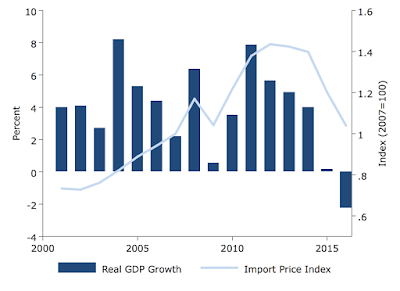 Of course, the increased oil prices can also have an indirect effect on real GDP growth. And as noted above, the policies of the Correa government in capturing the windfall from the rise in oil prices, and spending it, were a substantial part of this indirect effect. It is also worth noting that there was a substantial run-up in oil prices during the six years prior to the Correa administration, which you use as a benchmark. Oil prices as measured by World Trade Index crude more than doubled from $30.26 per barrel in 2000 to $66 in 2006. It appears that your approach suggests that direct spending on goods and services was indeed running counter to the business cycle for several years into the Correa administration, if not more recently. However, the filtering techniques that you used for cycle extraction are very unreliable ― particularly at the data frontier. In 2014, for example, both government consumption and output appear to have been running co-cyclically above trend for several years. However, had we performed the same analysis at the start of 2015 — based on data through 2014 — we would have found both had dropped below trend. Within your proposed framework, policymakers would have — based on real-time estimates— been misled. Such errors in policymaking resulting from unreliable estimates of trends may even cause unintentional co-cyclicality. That is, we must allow for the possibility that pro-cyclical outcomes were not a matter of policy. On the other hand, we know that the Correa administration intended to engage in countercyclical fiscal policy during the earlier downturn. 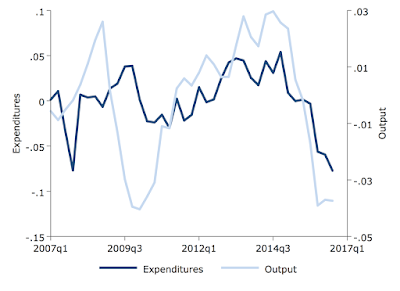 Thus, we forgo trend filtering and take a more direct look at the expenditure data. 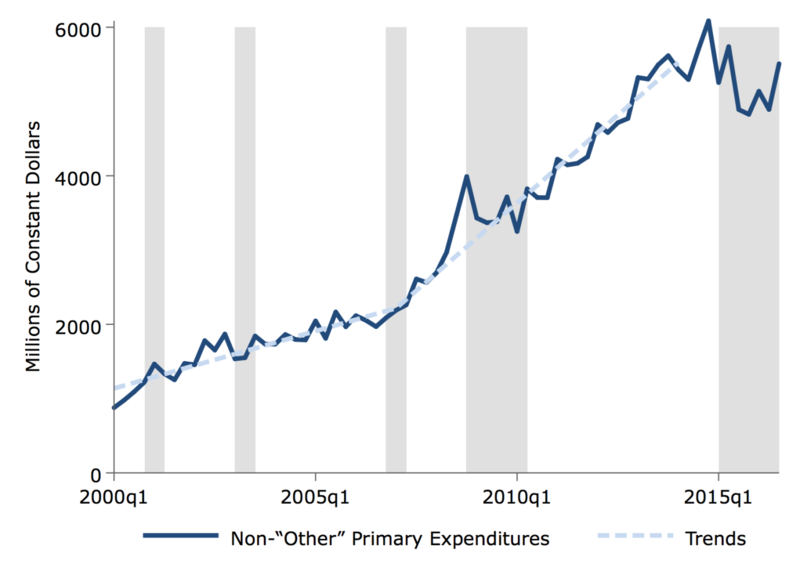 Figure 5 shows total primary (non-interest) expenditures since 2000. The monthly data has been seasonally adjusted using STL (Seasonal and Trend decomposition using Loess), and the resulting quarterly sums adjusted for inflation using the GDP deflator. 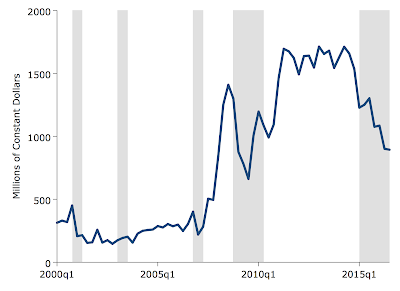 Quarters in which real GDP is reported as below an earlier peak are marked in gray. There is a pretty clear increase in the growth of expenditures around the time that Correa took office. 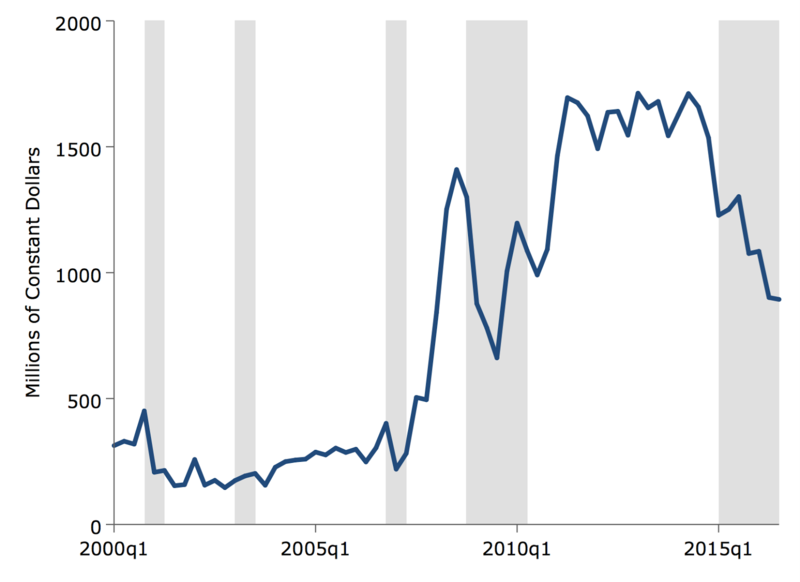 This trend has stalled or reversed in the last couple years, peaking in the fourth quarter of 2014 — just prior to the start of the most recent downturn. 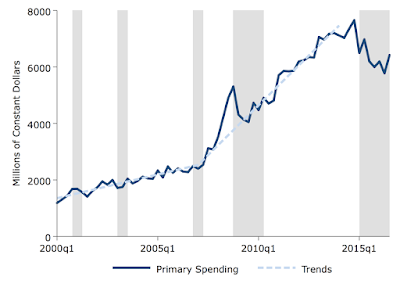 On top of the general increase in government spending, there was a sharp increase in spending during the year 2008, peaking with the business cycle in the fourth quarter. This seems to suggest pro-cyclical policy during the Correa administration, if not so much prior, but a closer examination reveals an important complication. Starting in 2008, the expenditure numbers began including Financiamiento de Derivados Deficitarios (CFDD) operations. As petroleum prices have coincided with the business cycle, this has produced spending cycles that also coincide with the cycle, as we see in Figure 6. It is important to note for purposes here that such CFDD expenditures are explicitly imports of refined petroleum products. 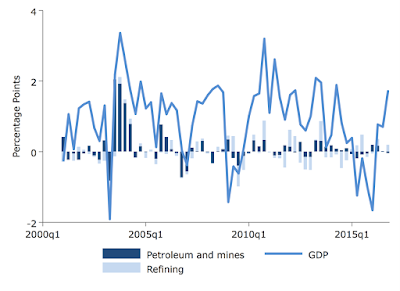 Indeed, the same fluctuations appear in 2008, when CFDD operations were added to petroleum income as well. It simply makes no sense to think of these fluctuations as connected to fiscal policy. They are directly moved by the price of oil. There was still some increase in spending in the second half of 2008, but the economy had been weakening throughout 2008, with unemployment rising from 5 percent in December 2007 to 6 percent in December 2008. 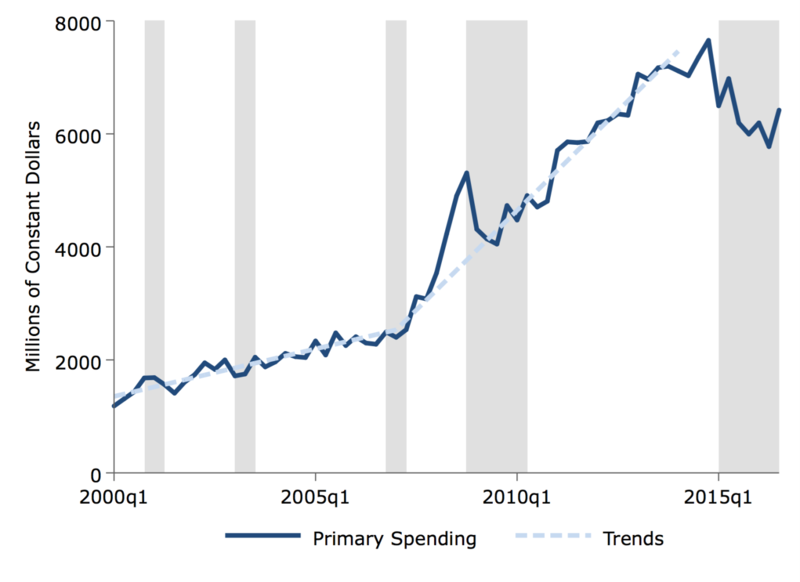 It appears that the additional spending in the latter half of 2008 helped stave off the recession. This illustrates an important point. 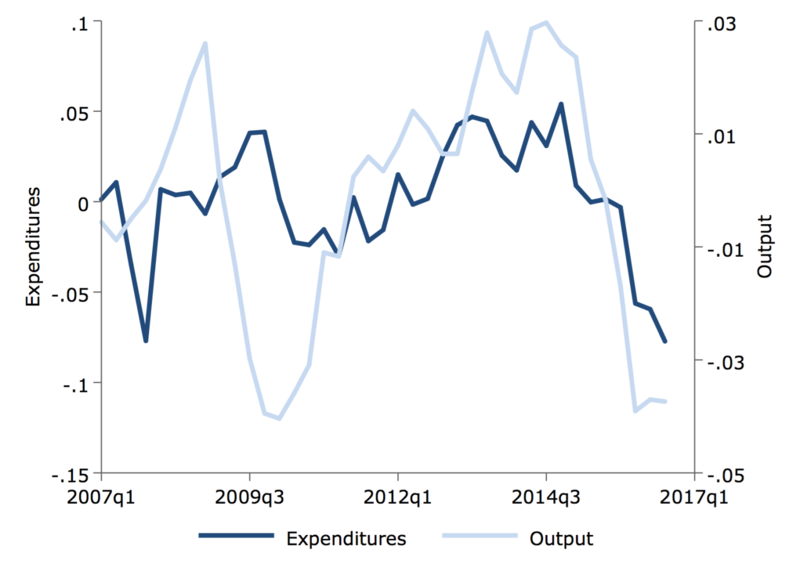 A positive correlation in cycles between spending and output does not imply fiscal policy is pro-cyclical. A perfectly stabilizing policy of countercyclical spending would not be correlated with cyclical output at all. Likewise, if countercyclical spending over-corrects for the cycle, then output rises and falls with spending, rather than the opposite. If we accept your Graph 4B as valid, then a 1 percentage point increase in the output cycle is associated with a 2.5 percentage point increase in government expenditures. If we take this relationship to be fixed as a baseline, then the multiplier on expenditures will vary inversely with the ratio of trend expenditures to trend output. This, in turn, suggests a path of counterfactual expenditures that would have stabilized output along the trend. Therefore, we find that, between the fourth quarter of 2007 and the fourth quarter of 2008, the stabilization of output around the observed trend required the government to increase expenditures from 19.8 percent of GDP to 27.5 percent. In fact, government expenditures rose from 19.7 to 29.4 percent of GDP. By this construction, in the first quarter of 2009 — having withdrawn much of this additional spending ― the government was still overspending by 0.5 percentage points of GDP. If anything, spending over these early years of the Correa administration suggests an overcorrection for the business cycle — not pro-cyclical fiscal policy. You claim that Ecuador’s economy has not grown especially fast under Correa, objecting to our comparison to the 1980–2006 period, preferring 2000 as a starting point because dollarization “represents a major structural break.” Ironically, you also cite the effects of the unusually strong 1997–98 El Nino as damaging to pre-2000 growth. Whether due to dollarization, El Nino, or other factors, the economy was pretty clearly depressed at the start of 2000. According to the Central Bank of Ecuador, GDP in the first quarter was 8.6 percent below its peak in the fourth quarter of 1997. By contrast, Correa inherited an economy less than 0.4 percent below its peak in the fourth quarter of 2006. This suggests that the potential for growth from 2000 to 2007 was higher than that from 2007 onward. At worst, the growth rates for the two periods are comparable. Similarly, you cite the 1987 earthquakes as damaging to growth over the 1980–2006 period. This is ridiculous. While GDP fell 6.0 percent in 1987, it bounced back quickly, growing 10.5 percent in 1988. Likewise, if the effects of the unusually strong 1997–98 El Nino must be accounted for, then what do we make of the even stronger 2014–16 event? The fact is, over decades there will be unusual events. There is no obvious reason to think that 1980–2000 was unusual in this regard. This is an account in which the government deposits funds to cover the cost of importing petroleum derivatives and liquid gas for domestic use. The unused money in this account is supposed to roll over at the end of the fiscal year.